This entry was posted in Book Reviews and tagged Aboriginal, ANZAC, Diggers, Douglas Grant, Harry Avery, Indigenous, Islander, Philippa Scarlett, Torres Strait, WW1, WWI by Andrew McIntosh CPA, Optimize Business. Bookmark the permalink. Hello, I have been researching the name of a rusty in poor condition rifle found by a bush care group in Callan Park, Lilyfield. My contact at the Lithgow Small Arms Museum is assisting me and asked if a war memorial in shape of the Sydney Harbour bridge was in the grounds of CP as a former aboriginal work mate Douglas Grant made the article while a clerk at Callan Park. I have been checking DG and find that the photo in the group of 3 may not be DG. Have you any further information please. Hi Kathleen, thanks so much for making contact! Yes, Douglas Grant’s War Memorial Bridge certainly was built in Callan Park and can still be visited today. 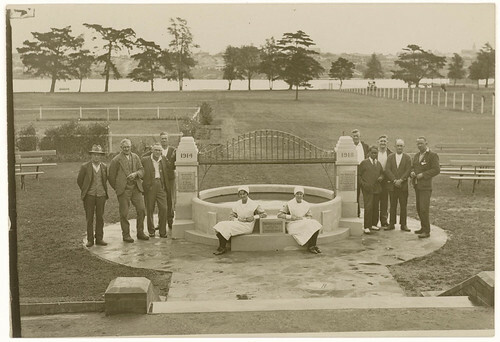 Grant designed the memorial and can be seen in the link below at the opening in 1931 with the then Governor of NSW. There is also a link below to photos of the Memorial showing it’s condition in 2009. I have written to the NSW Government and received assurance that the bridge is protected for it’s heritage value. It is specifically identified in the heritage plans for Callan Park and the local Aboriginal community are actively working to further recognise this significant site with a re-dedication planned. Thank you for your comment on the images of the Aboriginal standing next to Private Avery (the portrait of three soldiers from WWI), I find when people take the time to compare the images they do conclude that the Aboriginal man standing next to Private Harry Avery is not Douglas Grant. Please let me know if you have any questions as I have more information in my research to date (andrew@optimizesbiz.com) and I would love to connect further on the issue via email perhaps. I’m a resident at Prince Henry at Little Bay – the development on the old Prince Henry Hospital site, and run the community website http://www.princehenrycommunity.com.au. Each month, the volunteer web team tries to produce a history piece of relevance to Prince Henry residents and neighbours the the Did you know? Snippets from the past section, so on reading the SMH article this morning ‘Forgotten in the line of fire’ and discovering that Private Douglas Grant died at Prince Henry Hospital, I was inspired to do a little more research. Have there been any further developments in the debate that the Aboriginal soldier at left in the lovely photo of the three servicemen earlier on this page may not be Douglas Grant? The few alternative images of Douglas Grant I’ve found certainly reflect a distinct dissimilarity between those and the one on this page (also published with today’s SMH article? Hello There, I do not know how you found my email but for once I am happy to receive it as you refer to my favourite subject. I am a member of the Balmain Association and in the June 2013 issue of the Peninsula Observer I had an item publish re Douglas Grant. The memorial is still in Callan Park much depleted but will be restored next year, the 100 years since WW1. Regards, Kathleen Hamey. Hi Kathleen, glad you were happy to receive the email! You received it because you posted the first comment on Jan 19, 2013 about the rifle and when you did that you would have had to put in an email address, so you will receive responses. That is great news on the memorial bridge. I had written to the NSW Planning Minister about ensuring it was protected (in the park plan) which it was (I think thanks to your group) and I also engaged the local Aboriginal groups to ensure they knew of the site and its Indigenous significance. I understand there is now a three Council working party (?) that I may be in touch with your group, as they hope to have a rededication with special note to Douglas Grant’s role. Thanks Andrew. PS: I also contacted the Lithgow Small Arms Museum and was not able to get too much information from them, though I provided them what I had. Thanks for the note. Yes, I heard about the SMH article and the use of the Pte Avery photo of as an image of (I propose, incorrectly) as that of Douglas Grant. Nice to hear of the website for Prince Henry, it looks great! I have been researching further on who the Aboriginal man next to Pte Avery may be, but it is slow and tedious work, and like most projects, in spare time. 2. If it is not Douglas Grant, who is this “unidentified” Aboriginal man towering over a seated Pte Harry Avery (probably seat due to trench feet). So I am still pursuing this – the best photo to date I have seen is one I uncovered in the National Archive of Australia of Grant in a slouch hat. Have you seen that? Many thanks for your interest and lets keep in touch on the issue! Regards, Andrew. Hi Susan, thanks for your interest! No there have not been any major break throughs on finding true identify of the Indigenous soldier standing next to Private Avery and the British Soldier in WWI (photo courtesy of Rebecca Lamb). I am confident that it is not Douglas Grant, as you agree (thanks!) based on photos uncovered to date. I think until a new name with source material or substantial evidence is provided to the AWM, we will persist in seeing this man labelled (incorrectly) as Douglas Grant, as in the SMH article. I assume you found the images of him by the Bridge Memorial and the one I recommend writers use is a photo of him in a slouch hat from an ABC Radio report. Do you know the one I mean? The mystery continues – do you know who the two standing soldiers are in this WW1 portrait?